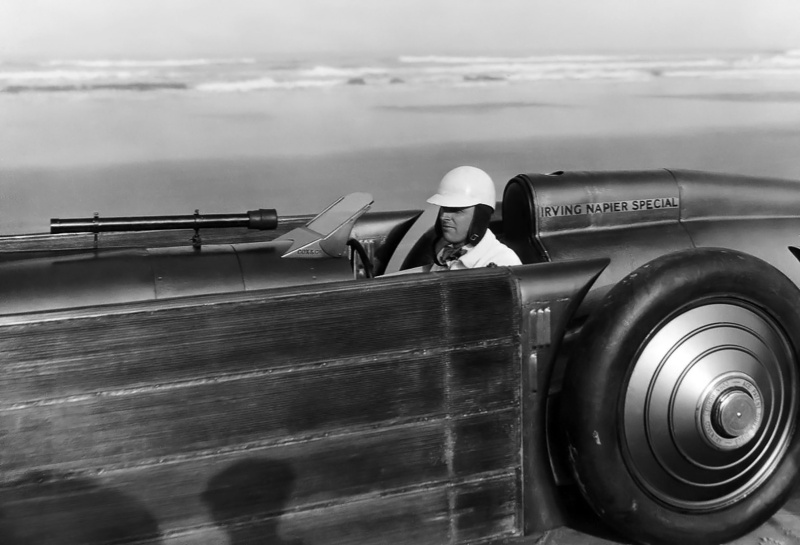 On 29 March 1927, Henry O’Neil de Hane Segrave set a new Land Speed Record (LSR) in the Sunbeam 1,000 hp Mystery Slug. Segrave achieved a speed of 203.793 mph (327.973 km/h) over the one mile course on Dayton Beach in Florida. Segrave was the first to travel over 200 mph (322 km/h) on land and returned to Britain a hero. However, he wanted to go faster. John Samuel Irving holds a model of the Irving-Napier Special / Golden Arrow. Irving was responsible for the car’s design, as well as the previous car Henry Segrave used to break the 200 mph (322 km/h) mark, the Sunbeam 1,000 hp Mystery Slug. Shortly after his return to Britain, Segrave parted ways with the Sunbeam Motor Car Company and joined the Portland Cement Manufacturers as a high-profile salesman. Segrave worked quickly to get the financial backing of his employer and from some of the sponsors involved with his previous record attempt. With funding secured, Segrave turned to John Samuel Irving to design the new LSR car. Irving had designed the Sunbeam Slug and had also left the company shortly after the successful record runs. Segrave’s 203.793 mph (327.973 km/h) record stood for less than a year before it was beaten by Malcom Campbell. 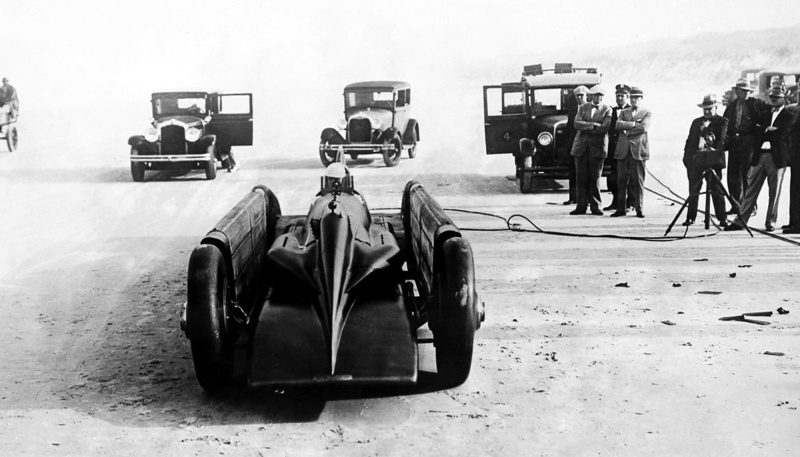 Driving his updated Blue Bird racer, Campbell averaged 206.956 mph (333.064 km/h) on 19 February 1928. Campbell’s record stood for only two months before it was slightly bettered by American Ray Keech driving the White Triplex at 207.553 mph (334.024 km/h) on 22 April 1928. The new records did not worry Segrave; much higher speeds were planned with the car Irving had designed. Segrave’s new car was initially called the Irving Special. Once the Napier Lion VIIA aircraft engine was acquired to power the car, its name was updated to Irving-Napier Special. The direct drive Lion VIIA had powered the Supermarine S5 aircraft that finished second in the 1927 Schneider Trophy, while the geared Lion VIIB engine powered the S5 that won the trophy. 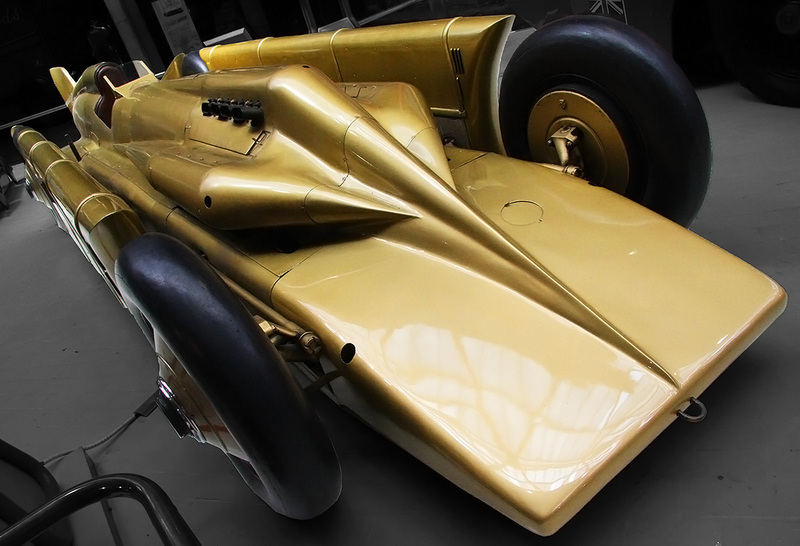 Once the car was painted its gold finish, it was often referred to as the Golden Arrow. 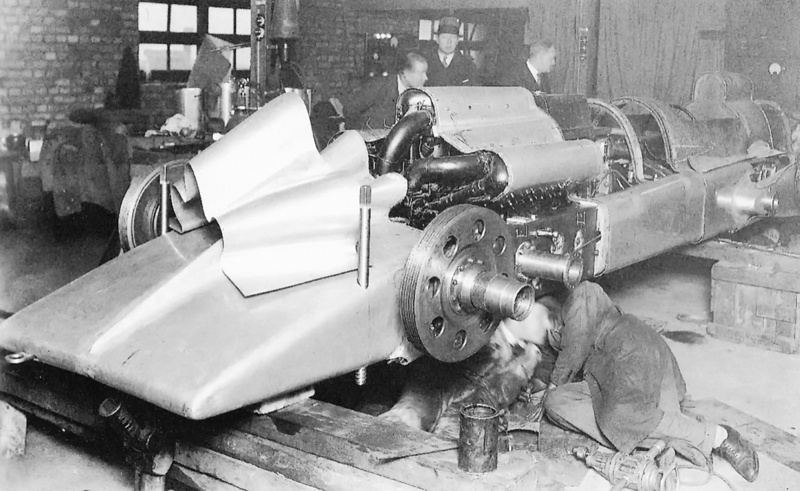 This image of the Golden Arrow being built shows just how closely the cowling fit over the Napier Lion engine. The front two screw jacks can be seen passing through the car’s body. The holes and fins on the brake drums were to help dissipate heat. Note the stout frame rail. The Napier Lion VIIA was a W-12 (or broad arrow) engine design with a 5.5 in (140 mm) bore and a 5.125 in (130 mm) stroke. The engine displaced 1,461 cu in (23.9 L) and produced 930 hp (694 kW) at 3,400 rpm. The Lion engine was installed in the Golden Arrow’s narrow frame, just behind the front wheels. The car’s frame rails were made of channel section steel 13 in (330 mm) tall and 4 in (102 mm) wide. Each corner of the frame had a threaded jacking point. The rest of the Golden Arrow’s structure was made from tubular steel and wood. A three-speed transmission was mounted behind the Lion engine. Gear ratios and theoretical maximum speeds were 3.0 to 1 and 81 mph (130 km/h) for first gear, 1.54 to 1 and 166 mph (267 km/h) for second gear, and 1 to 1 and 246 mph (396 km/h) for third gear. The transmission took the engine’s power and distributed it to two drive shafts that rotated in opposite directions. The shafts passed along both sides of the cockpit and to the rear axle. This arrangement allowed the driver’s seat to be placed some 8 in (200 mm) lower than if the driveshaft passed under the seat. The Golden Arrow was carefully packed for its trip across the Atlantic. The covers over the surface radiators were regularly used when the car was not being run. Note the black “aiming” stripe on the upper engine cowling. The car’s narrow cockpit was designed especially for Segrave, and the cockpit side panels were attached after Segrave was in the driver’s seat. The offset driver’s seat in the Sunbeam Slug had made driving the car at speed slightly more challenging. Irving decided to have the driver positioned right on the centerline of the Golden Arrow. Steel plating .25 in (6 mm) thick encased the cockpit to protect the driver. A telescopic sight was placed in front of the driver, and a sighting tab was located in front of the engine on the upper cowl. In addition, a black stripe was painted along the center of the car. This was all done to make driving the Golden Arrow as easy as possible at well over 200 mph (322 km/h). The steering gearbox was positioned on top of the transmission. A drag link extended from each side of the box to the front wheels. The wheels themselves were not linked together by a tie rod. The car’s drum brakes and clutch were vacuum assisted. The Golden Arrow’s tires were specially made by the Dunlop Rubber Company. The tires were 37 x 7 in (940 x 178 mm) and filled with 125 psi (8.6 bar) of air. Dunlop had guaranteed the tires to last 25 seconds at 240 mph (386 km/h). At that speed, it would only take 15 seconds to travel the measured mile, and the tires would be changed after each run. A streamlined fairing extended back from each front wheel to each rear wheel. The fairing improved the aerodynamics of the car and was covered in surface radiators built by the Gloster Aircraft Company. Special covers were placed over the surface radiators to protect them when the car was not running. The surface radiators served as the primary means to cool water for the Golden Arrow’s engine. However, if the engine temperature rose too high, a secondary cooling system was employed. This system consisted of an isolated chemical compound in a tank positioned in the front of the car. When the engine got too hot, thermostats allowed water from the engine to flow through the tank where it would be cooled by the chemical. Unfortunately, which chemical was used has not been found (perhaps dry ice or cardice). The header water tank was located behind the engine, and two oil tanks were located in the frame rails. Segrave poses in the Golden Arrow on Daytona Beach. The telescopic sight has been installed in front of the cockpit, and the fore sight has been installed on the front of the top cowling. These sights were removed after the car’s first practice run. Note the aerodynamic wheel covers. 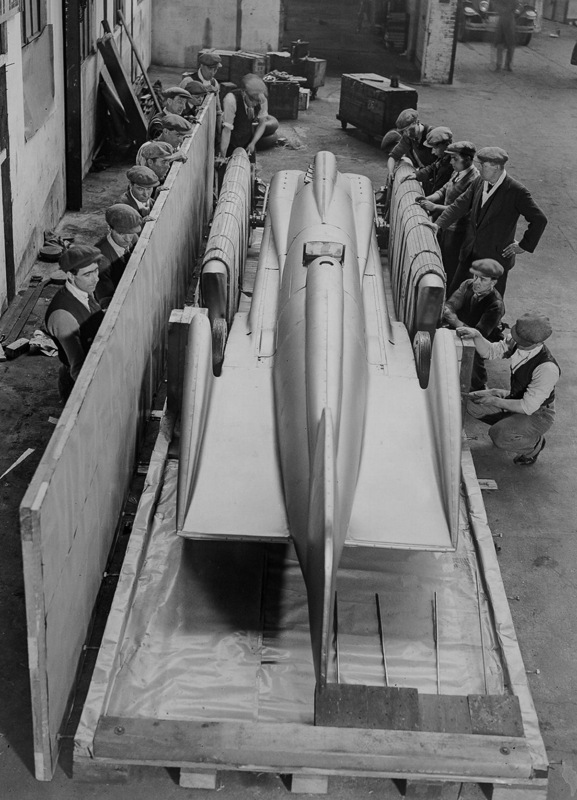 With the use of a wind tunnel, Irving designed the Golden Arrow’s body to minimize frontal area and drag. The body sloped to a point in front of the engine, and the engine’s three cylinder banks were very closely cowled. The car’s streamlined body flowed back to the cockpit, located in front of the rear wheels. Behind the cockpit was a 24 gallon (91 L) fuel tank, and the body transitioned into a tail to provide directional stability at high speeds. 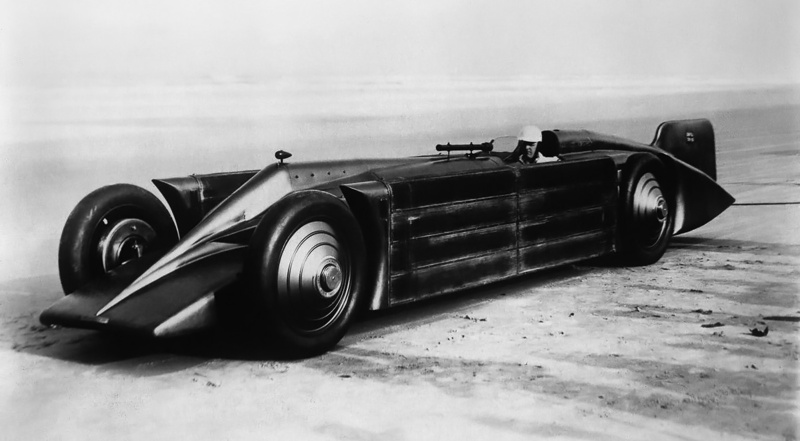 The Golden Arrow’s main body was inspired by the Supermarine S5 Schneider racer, and the entire body was designed to provide downforce to keep the car on the ground. The car’s aluminum body was built by coachbuilders Thrupp & Maberly. The Irving-Napier Golden Arrow was 27 ft 6 in (8.38 m) long, 6 ft 1 in (1.85 m) wide, and 3 ft 8 in (1.12 m) tall. The car had a 14 ft (4.27 m) wheelbase, a 5 ft (1.52 m) track, and 7 in (178 mm) of ground clearance. The Golden Arrow weighed around 7,694 lb (3,490 kg) loaded. Irving and Segrave wanted to set the LSR at over four miles per minute—240 mph (386 km/h). The Golden Arrow was built in 1928 at Kenelm Lee Guinness’ Robinhood Engineering Works. The car made its public debut at the end of January 1929. Virtually no testing occurred before the car, Segrave, and team left for Daytona Beach, Florida on 31 January 1929. Upon arrival, weather conditions were poor, and it was not until 20 February that Segrave took the car out for it first practice run. This was actually the first time Segrave drove the car. He went up and down the beach once, hitting a top speed of over 180 mph. Segrave then drove the Golden Arrow on public streets the short distance back to the garage. A few modifications were made, such as the removal of the telescopic sight and installing a smaller front sight. Segrave now thought the car was perfect and that it was time to make an attempt on the record. A close-up of Segrave in the Golden Arrow shows details of the surface radiators, the telescopic sight, and Segrave’s rudimentary crash helmet. The cockpit side panels are not attached. Note that “Irving Napier Special” is painted behind the cockpit. On 11 March 1929, the weather and beach conditions were acceptable to make a LSR attempt. Around 100,000 spectators turned out to watch, and large arc lights were strung at both ends of the measured mile. Segrave lined up the sights on the Golden Arrow as he rocketed north along the beach, shifting gears at 3,200 rpm. Fighting a cross wind, he passed through the measured mile in 15.55 seconds, averaging 231.511 mph (372.581 km/h). Suddenly, a radiator hose loosened, spraying hot water over Segrave, but he managed to maintain control. After the run, the water line was fixed, tires were changed, and water and fuel were replenished. Segrave now made his run southward, still battling the crosswind. After using 4 miles to come up to speed, the Golden Arrow ran through the measured mile in 15.57 seconds, averaging 231.214 mph (372.103 km/h). The average of his two runs gave Segrave a new LSR of 231.362 mph (372.341 km/h)—23.809 mph (38.317 km/h) faster than the previous record set by Ray Keech in the Triplex. Some sources list the speed as 231.446 mph (372.478 km/h), which was Segrave’s speed for the flying kilometer, not the mile. At the end of the run, Segrave hit a gulley in the sand, and the Golden Arrow twisted sideways, damaging the right surface radiator. Front view of the Golden Arrow as the car and Segrave pose for photographers. The exhaust stacks for the Lion’s side banks were on the bottom of the cowling. Segrave did not have any issues with exhaust fumes entering the cockpit. The record had come easy. 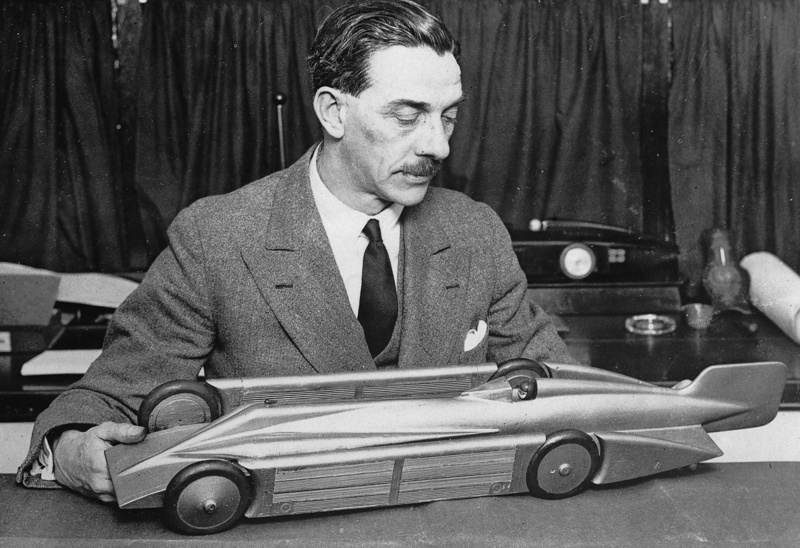 Segrave felt the Golden Arrow had more speed left, and the car was repaired for another run. However, Segrave decided that he would only make another record attempt if the White Triplex beat his speed. Driven by Lee Bible, the White Triplex took to the course on 13 March 1929. Bible’s first run was at 186 mph (299 km/h) and his second was at 202 mph (325 km/h). However, something happened at the end of the second run that caused Bible to lose control of the Triplex. The car crashed, killing Bible and Charles Traub, a British Pathé cameraman who was filming the record run. The accident put an end to the 1929 record season at Daytona. Segrave returned to Britain and was knighted on 27 April 1929. A short time later, Segrave declared that he was done with LSRs. He found Water Speed Records more of a challenge and focused his efforts there. On 13 June 1930, Segrave made two good runs on Windermere lake in his Miss England II motorboat powered by two 1,800 hp (1,342 kW) Rolls-Royce R engines. Accompanying him were mechanic Michael Willcocks and Rolls-Royce engineer Victor Halliwell. Although Segrave did not know it at the time, the runs established a new water speed record at 98.76 mph (158.94 km/h). 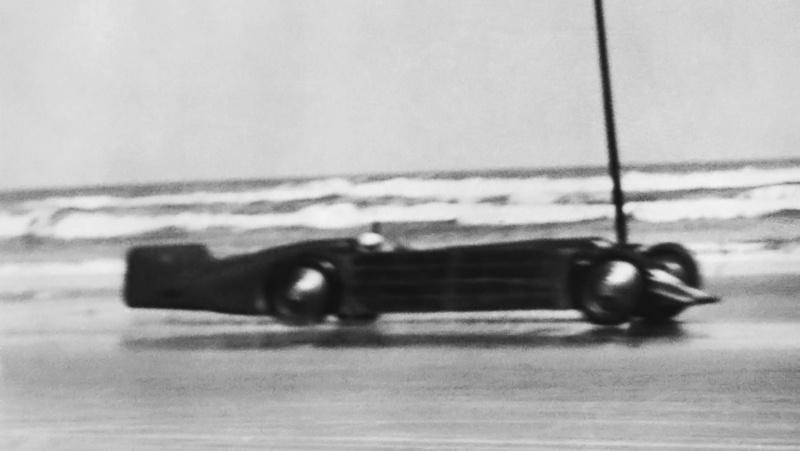 Segrave and the Golden Arrow making their south run on Daytona Beach at 231.214 mph (372.103 km/h). Few images of the car at speed exist despite numerous photographers attending the record attempt. At the time, photographers had little experience capturing high-speed subjects. Note that the original sights have been removed. Segrave had made the first two runs at less than full throttle and knew that he could do better. Without coming to shore, he immediately set out for another two runs. On his third run of the day, Miss England II was traveling around 120 mph when the boat hit some debris and violently capsized. Segrave, Halliwell and Wilcocks were all thrown into the water. Willcocks was pulled from the water alive. Halliwell was killed in the crash; his body was recovered two days later, still clutching his pencil and notepad. Segrave was found unconscious and taken to a shore-side house where he was treated by doctors. Segrave regained consciousness, asked about Willcocks and Halliwell, asked about the record, and then passed away from his injuries. Segrave was the first person to simultaneously hold the World Land Speed Record and the World Water Speed Record. The Irving-Napier Golden Arrow was never raced again after its record run, and the car has been driven under its own power fewer than 40 miles (64 km). The Golden Arrow was preserved and is currently on display at the British National Motor Museum in Beaulieu, Hampshire, United Kingdom. This entry was posted in Automotive and tagged Land Speed Record on 20 September 2017 by William Pearce. What a fantastic looking machine! It looks futuristic even after the passage of 87 years! It must have been something to hear with that engine blazing at full power as it made its speed runs. I could not agree more Frank. Thank you for your comment.